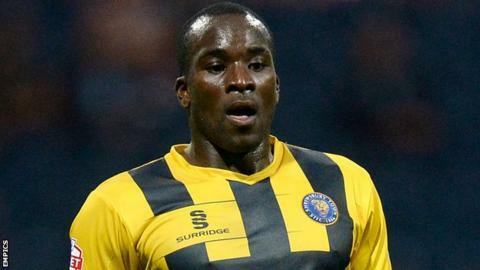 Carlisle United have signed midfielder Anthony Griffith on an 18-month deal after he reached an agreement to end his contract with Shrewsbury Town. The 28-year-old joined the Shrews in August after he left Port Vale, but has played just 228 minutes this season in his six appearances at the Meadow. He has made 302 league appearances in his career for eight different clubs. "It's a challenge and a chance to play football and get out there again," Griffith told BBC Radio Cumbria. "I want to impress the manager and I feel like a big kid again wanting to play football." He joins a Carlisle team just a point above the League Two relegation zone with 21 games left to play, and without a win in three matches. "I'm relishing the chance to do what the manager wants me to do, we do need the young players to know this is a dogfight," added Griffith. "It's an opportunity for me to probably help the young players as well." Griffith began his career at Doncaster but spent the bulk of career at Vale Park across two spells, but struggled for opportunities at Shrewsbury. The Montserrat international is grateful to the Shropshire side for helping to restore his fitness, however, he now wants to play for Keith Curle's Cumbrians. "I wasn't looking for a move away, I was just looking to play football," he added. "Keith contacted me and I jumped at the chance, no matter where it was. "I made it clear to the manager and took it from there, hopefully I can take it with great pleasure."